I had a wonderful conversation this morning on Twitter with a teacher from New Zealand that commented on a tweet about using Skype Classroom to go global. She mentioned how her students were going to Skype and talk to kids in Iowa. I just love the fact that the world gets so much smaller when we use technology like that. There really are endless learning opportunities for students (and teachers as well). During the North African uprisings a high school teacher here in my district was struggling to get her students to understand the whys of those events. It was easy to read about them in a magazine or watch a news report but she knew there had to be a better way. We talked and I suggested we try to Skype someone in. It was a long shot to get someone from that region but worth it so the students could hear first hand what was happening and why it was happening. I took to Twitter and through some connections was put in touch with a teacher in southern Egypt. We arranged a brief Skype chat where he was able to describe what was happening and, most importantly, the why. We knew it was important to connect the students to their content. And we did so by going global. You know it's important too. But where do you start? And what sorts of global projects are out there? First, what tools will you need? That's a tough one to answer. It will all depend on the type of collaboration and project you want to undertake. Internet is a must. But if you want to do video chatting, a good webcam and external mic is necessary. I always recommend external devices for that sort of thing. Built-in stuff can be a challenge to manipulate and get the image or the sound just right. Spend a little bit of money and get something good. You will also want a Skype account. Skype to Skype calls are free and include video. You can use your Skype account to call cell or landline numbers for a fee but for collaboration voice and video are always great and free. Google Hangouts can be a great alternative. If you have a Google account you can start a video hangout with up to 10 people which is great for multiple rooms participating or multiple locations. And Hangouts make it easy to record your sessions and post them to Youtube later. So, with the software and hardware out of the way we can focus in on where to find people and projects. Hashtags-Yep, Twitter. Ok, I know. You've heard me ramble on about Twitter. But seriously. If you want to make global connections, you've got to be on Twitter. I mean, where else can I have a conversation with a teacher in New Zealand at 4am? Hashtags make it easier and easier to narrow your focus on who to collaborate with. And with the number of state and national chats and hashtags it might only take a matter of moments to find someone. Check out my post on using Hashtags and visit this page to see all the current educational hashtags being used. Teacher's Guide To International Collaboration On The Internet-From the U.S. Dept. of Education, this handy resource is full of ideas and projects for collaborating internationally. Everything from email exchanges to video chatting to global challenges can be found here. And it's broken down by subject area so you can easily find a project to fit your needs. QuadBlogging-This is one of my favorite projects. The idea here is you and your students blog and comment with other students in another country. One week your class does the writing and the other classes comment and the next week it switches. It can be very insightful to see what other students are writing about. I have seen some pretty powerful posts come from this project. Check out their website to learn more. Skype Classroom-As I mentioned before, Skype Classroom can be a powerful resource to connect your classroom to the world. Registering for free with your Skype account gives you access to message boards that allow you to look for someone to collaborate with or post looking to collaborate with someone else. You can direct your posts for specific countries or regions too. And the projects here are pretty neat. Definitely a place not to miss. Guide To Management-Getting involved in all this can be overwhelming. My friend Shelly has a simple Prezi that can help you better understand the management side of this and offers some tips on how to keep everything going. 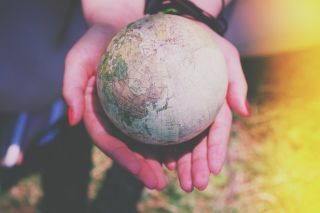 Have you made a global connection? What tips to do you have for others getting started? Leave your comments below.